Kuala Lumpur, 22nd July 2013 – Hong Leong Yamaha Motor Sdn. Bhd. 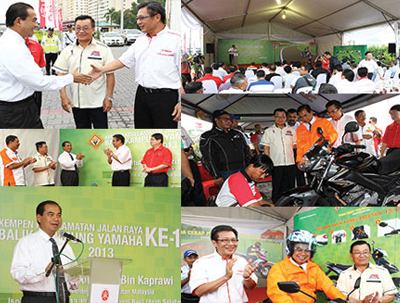 (HLYM) launched its 15th Yamaha Balik Kampung Road Safety Campaign 2013. Jointly organised by HLYM and Malaysia Motorcycle & Scooter Dealers Association (MMSDA), the road safety campaign themed “Minda Cekap, Perjalanan Selamat”, (Sharp Mind, Safe Ride) highlights the importance of having the Right Attitude, Correct Knowledge and proper Riding Skills when travelling on the road during the festive season of Hari Raya. The Deputy Minister of Transport Malaysia, YB Datuk Abdul Aziz Kaprawi, was there to officiate the launch at Sungai Besi Toll Plaza. During the event, the importance of motorcyclists taking responsibility for their own lives as well as others on the road, and ensuring their motorcycles are in good condition were emphasized. “Our free 15 point safety check which we have been conducting over the past 15 years on all brands of motorcycles is our way of contribution to this end,” said Mr. C.H Ng, Managing Director of HLYM. Also committed to making this campaign a success are the Road Safety Department of Malaysia (JKJR), Malaysian Institute of Road Safety Research (MIROS), Road Transport Department of Malaysia (JPJ), Ministry of Transport (MOT) and other relevant agencies. The campaign is primarily aimed at educating all motorcyclists to inculcate safe riding habits and to prioritize vehicle maintenance. The Yamaha Balik Kampung Road Safety Campaign made its debut in 1999. Today, apart from creating awareness, HLYM would also conduct 15-point safety checks on all motorcycles and advise motorcyclists on the importance of periodic maintenance. Another interesting and effective initiative under this road safety campaign is the Yamaha Safety Riding Science demonstration (YSRS) which is aimed at educating motorcyclists on safety riding skills from a scientific approach. The demonstration will be carried out at all five locations, starting from Sungai Besi Toll Plaza, this year. As part of the effort to enhance the road safety campaign, FKR Tyre Manufacturer will also be stationing its technical advisors at each of the above location to conduct checks and educate motorcyclists on tyre maintenance. In addition, 100 new SIRIM approved helmets will be given away to replace unsafe, old or worn out helmets at each location, courtesy of KHI Helmets and AEON Credit Service. The participants of the 15 points maintenance check will receive a free safety vest, courtesy of P&O Insurance, and a Yamaha booklet featuring the highlights of the event, safety tips as well as reflective stickers. About Hong Leong Yamaha Motor Sdn. Bhd. Hong Leong Industries Bhd., holds majority equity interest in HLYM, is part of a well diversified conglomerate, Hong Leong Group of Companies, Malaysia. 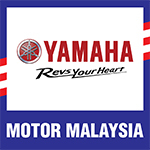 HLYM was appointed official franchise holder for CKD and CBU Yamaha motorcycles in Malaysia since 1978. It rolled out its first CKD Yamaha street model, RX100 at the Shah Alam plant in 1979.